Almost seven years ago, I began a journey that would teach me more about brain Cancer than I ever would have thought possible or necessary. In the early morning hours of March 10, 2003, my then girlfriend (now wife) rushed me to a hospital emergency room in Newton, MA with the worst headache of my life. I had been having bad headaches for a few years that were dismissed by my primary care physician due to family history of migraines. Assuming that it was just another bad migraine, I dismissed the need for a CT scan as an unnecessary precaution and probable waste of time. Unfortunately, I was wrong and this would be the first of many scans and procedures in the years that have followed. The CT scan revealed that I had a mass on my right Frontal Lobe the size of a tennis ball. Once this was found, I was sedated and confined to a private room while all of the surgical options were considered. The following morning, I had a six hour brain surgery where a neurosurgeon removed as much of the invasive mass as possible. The brain Tumorâ€™s pathology revealed it was an anaplastic astrocytoma, which is a grade III Malignant Glioma. The day after surgery, I was visited in ICU by a Medical Oncologist who told me to consider getting my personal affairs in order. The type of tumor that I had was generally fatal within one to three years after diagnosis, even with all of the currently available treatment procedures. At the time, I was 31 years old. In the weeks and months that followed, I went through six and a half weeks of daily radiation treatments at Massachusetts General Hospital in Boston and was put on a brand new oral Chemotherapy pill called Temodar. This drug had only been around for a few years at the time and was still considered experimental. My Radiation Oncologist at MGH had a hunch that treating me with the chemotherapy at the same time as I was receiving daily radiation would greatly improve the outcome for each of the treatments independently. Fortunately, he was correct as I passed the five year survival mark on March 10, 2008 and was officially declared â€˜in remissionâ€™. Since my initial diagnosis in 2003, I have had two additional high dose stereotactic radiation procedures and a second brain surgery in 2004 to remove radiation induced scar tissue and install three titanium plates and six screws into my skull. I also spent four years receiving chemotherapy every 28 days and almost seven years having regular MRI scans with almost constant fear that the tumor would inevitably recur. It hasnâ€™t been easy getting to this point but I can confidently say that I wouldnâ€™t be alive today if it wasnâ€™t for cancer research. Even after all these years and everything that I have been through, I am still not considered cured as the tumor could still recur at any point. This fear makes the time around my six month follow-up scans very stressful and mentally difficult for me and my family. I am pleased to say that my most recent scan in December was still clear and showed no signs of recurrence. I have my next scan in May and have my fingers firmly crossed that my streak of good luck continues. My wife Allison has been by my side through all of this and has dealt with more than anyone should have to. On March 10, 2006, I was driving to see one of my favorite bands Nine Inch Nails in concert to celebrate my â€˜cancerversaryâ€™ and officially outliving the maximum expiration date that I was given three years earlier. This was the first day that I really felt that I had a future and decided that I would propose to Allison a few months later during a trip to Disney World. 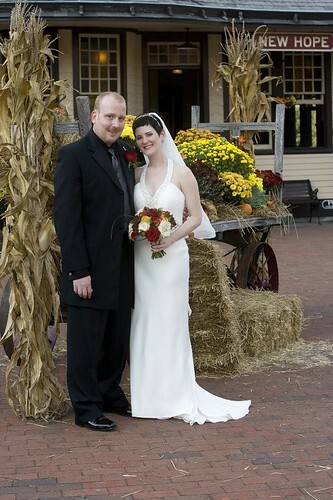 We were married in New Hope, PA in October 2007. Once I hit the five year survival point in March of 2008, we decided to put the drama of the past several years behind us and move away from MA to PA. 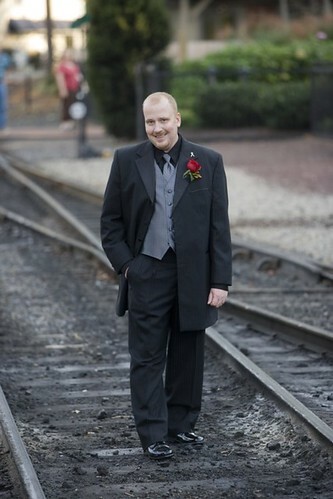 I am originally from the Philadelphia suburbs and wanted to reconnect with family and friends that I have missed since I was transferred to New England by a previous employer in 2000. Through all of this, my wife and I have learned to take one day at a time and make the most of our time together. We share our lives with two cats (Mandinka and Pluto) and our bunny (Anya). When I took sick and was given a very grim Prognosis, my mantra was â€œI am not a statisticâ€ and we adopted the word â€œBelieveâ€ as part of our armor to protect us in the battle ahead and remind us to stay positive. I feel very fortunate to have done so well and lived as an exception and not the rule as defined by brain cancer statistics. I'm so sorry it has taken me so long to get back in touch with you but the last six months have really taken a mental and physical toll on me. I'm off the Temodar now and my most recent MRI shows that everything looks stable. I am still dealing with the effects of the chemo but feeling a little better each day. My Dr said it will be three months before I feel like I did before I went back on the Temodar in December. We are crossing our fingers that the area of concern is now dead tumor cells or scar tissue and doesn't change between now and when I have my next MRI in August. Attached is a copy of one of the shots from my recent MRI that shows the area that has caused all of this drama. 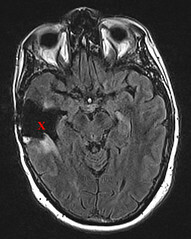 It is the white area sticking up below the X into the cavity where brain tissue was removed when they went in after the tumor in 2003. Regular MRI scan showed new area of uncertainty and follow-up MRI was scheduled for two months. MRI showed definite tumor recurrence and surgery was scheduled. Had 3rd brain surgery since 2003 to remove as much of the new tumor as possible. Luckily, the tumor's pathology was the same as in 2003, Anaplastic Astrocytoma grade 3, so it was decided that I was to be treated with radiation and chemo as before. I had a very rough recovery from the surgery and began leaking spinal fluid through the incision in my skull causing a large bulge on the side of my head. My neurosrugeon through the fluid would get absorbed in a few weeks and go away but it didn't. I became symptomatic from spinal fluid buildup causing pressure and bleeding on my brain. Suffered from stroke like symptoms and was rushed to the emergency room and transferred by ambulance to the hospital of the University of Pennsylvania where I had my 4th brain surgery on 13th April to install a permanent shunt device which drains spinal fluid from my brain into my abdomen. My cancer treatments were delayed by various bumps in the road but I started six months to a year of more extremely high dose chemo last month and had five days of cyberknife radiation treatments from 7th to 11th May 2012. My most recent MRI showed some brain swelling from the intense radiation but that is to be expected. We are hoping that my next scan on 26th July is still stable and we can try to get some of our peace of mind back. In early Julu pain and weakness in my right leg was found to be a nasty blood clot. I was put on 2x daily blood thinner injections for at least six months. MRI from July showed more brain swelling from the radiation that we are trying to manage by continued adjustments to my steroid dosage. I am still on a regimen of five days of high dose Temodar every four weeks. My next MRI will be on 28th September 2012 and we are hoping / praying for stability.